AMAG provides security solutions ranging from access control systems, to complete video management, to identity authentication solutions, to visitor management, to all in one security and access control solutions. The company’s Symmetry platform is designed to combine security equipment and software into a system for enterprise access control that runs on client software or via SymmetryWEB web client. Comprehensive user rights functionality enables you to specify which features and options are available to any operator. One of the newest additions to the Symmetry Access Control Systems is SymmetryM4000 – an intelligent and expandable door controller that supports 4 doors, 1 million credentials, and 65,000 offline transactions. This controller provides support for OSDP, Wiegand and AMAG’s own MCLP reader communications, thus enabling organizations to install any card reader. This in turn mean you can have your enterprise access control customized to your specific needs. Their products and services list is quite long, so you should check their website to find a specific solution and features that fit your needs. Out-of-the-box integrations with the most popular Active Directory services such as Microsoft Azure AD or Google Apps. Access control systems gradually embrace the advantages offered by mobile access and remote system management. 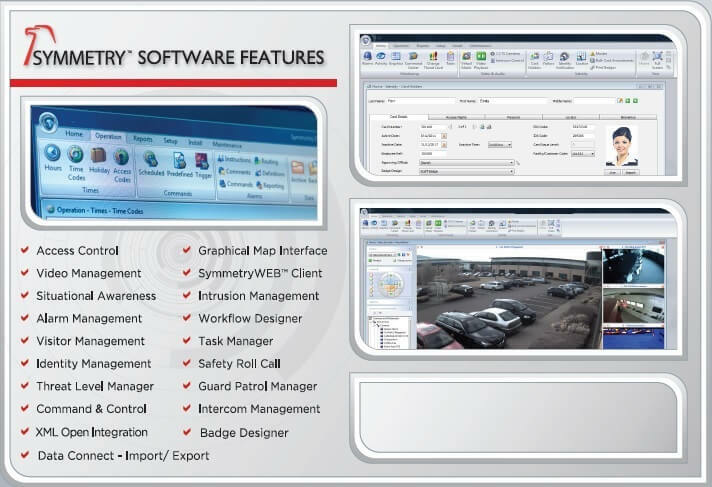 AMAG offers a web client version of Symmetry Access Control software, SymmetryWEB, which enable organizations to manage business-critical functions using a mobile device. Users are able to approve new cardholders and assign access codes on the go, markedly improving the process of access cards administration. You can assign user rights defining who has rights to view specific devices and cardholders. All the features are available through a web browser running on a desktop computer or a mobile device. All communications within the web module are over HTTPS protocol, providing a further layer of security. Are AMAG Systems Suitable For Your Organization? As we said, the Symmetry Access Control Systems are expandable, which in turn means it can suit the needs of both small offices and large organizations. AMAG systems are in use by a variety of customers across many different industry verticals. Implementations of security solutions include organizations as varied as multinational financial institutions, healthcare organizations, public agencies, universities, utilities, and large commercial enterprises. ‍ Symmetry access control systems offer the complete range of features required by any business. The company also offers to upgrade your legacy security systems and keep existing card readers and wiring infrastructure to reduce the overall upgrading costs. A top advantage of AMAG’s Symmetry platform is that you can expand and downscale features and modules depending on your specific security needs. Scalability enables organizations to implement an enterprise access control strategy in accordance with their expansion plans or downscale the system when a need arise. Access rights policy management requires massive efforts across a large organization. Thus, a beneficial feature is to have automated workflows that streamline key processes that govern the management of diverse identities across your organization. Symmetry CONNECT is one such feature that provides you with policy-based identity management platform. Other benefits to larger organizations include threat level management capabilities, task manager to automate recurring or one-time security tasks, as well as a workflow module. One of the few disadvantages of the AMAG systems is that they do not have off-the-shelf biometric readers which means you need to install third-party biometric devices. For further information about access control costs involved, take a look at our article on access control systems installation costs. If you are looking for an alternative to Linear, see how Kisi works here.